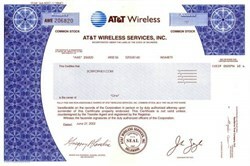 Beautifully engraved certificate from the AT&T Wireless Services, Inc. This historic document was printed by the Security-Columbian Banknote Company and has an ornate border around it with a vignette of the company logo. This item has the printed signatures of the Company’s Chairman and CEO and Senior Vice President, General Counsel and Secretary. ATLANTA – Cingular Wireless LLC, a joint venture between SBC Communications Inc. (NYSE: SBC) and BellSouth Corp. (NYSE: BLS), said it has completed its previously announced merger with AT&T Wireless Services Inc., creating the nation’s biggest wireless carrier with the largest digital voice and data network in the country. The newly combined company, with more than 46 million customers and an extensive nationwide network, will offer consumers maximum convenience and flexibility, improved reliability, enhanced call quality and the widest array of new and advanced services. With more than 21.4 million subscribers, AT&T Wireless is the #3 US mobile phone service provider behind Verizon Wireless and Cingular Wireless (the SBC-BellSouth joint venture). AT&T Wireless offers service nationwide, and its Digital One Rate plan (one rate anywhere in the US) has proved to be a big hit. The company operates over its own network (19.5 million subscribers) and through affiliates, such as Virginia-based TeleCorp PCS, which AT&T Wireless is buying. The company formerly traded as a tracking stock of AT&T and was spun off in 2001 as part of AT&T's restructuring. Japanese wireless giant NTT DoCoMo, which is partnering with AT&T Wireless to develop mobile multimedia services, owns a 17% stake.